Last Meeting: Nov. 18, 2018; Gonzaga won 70-55 in Missoula. Series Notes: Gonzaga and Montana meet for the 31st time in program history and the second-straight season. The two programs met annually from 1987-2012 but took a brief hiatus from 2013-17. Montana dominated the series early, winning 10-straight contests to open the series from 1981-93. The Bulldogs have won eight of the last 10 meetings including the last six. In the last six matchups, Gonzaga has defeated the Griz by an average of 16.3 points per game with their largest margin of victory coming in 2010 with a 75-48 win in Spokane. In the last meeting, three Bulldogs finished in double-figures, led by Jill Barta with 23 points while Chandler Smith and Laura Stockton added 16 and 11, respectively. - Montana returns six letter winners and four starters from last season's squad that finished 14-17 overall with a 9-9 mark in Big Sky play, good for a tie for seventh. - Last season, Montana averaged 64.1 points per game shooting 39.8 percent from the floor including 27.5 percent from long range. The Griz averaged 39.5 rebounds per contest with a +5.0 rebounding margin in addition to 2.8 blocked shots per game. As a team, the Griz dished out an average of 13.8 assists per game to go along with 5.7 steals while forcing 12.8 turnovers per game. - Returning junior guard McKenzie Johnston led the Griz is scoring at 12.5 points per game; Montana loses 10.5 points per game with the departure of Caitlin Lonegran. Johnston was named Honorable Mention All-Big Sky for her efforts. - This season, the Griz were picked to finish fifth in the Big Sky coaches' poll and seventh in the Big Sky media poll released in mid-October. - Montana also faced Carroll College in its lone exhibition contest of the year, defeating the Saints 71-56 in Missoula on Oct. 30. Three players finished in double-figures for the Griz led by Johnston with 14 points; Jace Henderson chipped in 12 while Gabi Harrington added 10. Henderson also corralled 13 boards for the Griz for the only double-double of the game. As a team, Montana shot 43.9 percent from the## floor and 26.7 percent from long range while limiting Carroll to 31.8 percent shooting. - The Zags are 27-5 all-time in regular-season home openers and have won the last 13. - The Bulldogs last loss in a home opener was in 2003, a 73-57 loss to Oregon. The Zags have never lost a home opener inside the McCarthey Athletic Center. - The Zags have never faced Montana in their regular-season home opener. After over four weeks of practice facing just each other, the Bulldogs finally had a chance to stretch their legs against an opponent other than themselves in an actual game environment. In front of 5,370 strong, the Bulldogs rolled Carroll 86-43 on Nov. 2 in the McCarthey Athletic Center. Gonzaga shot 55.7 percent from the floor and a staggering 46.7 percent from long range while scoring nearly at will inside with a 32-18 advantage in the paint. The Zags were relentless on defense, forcing 21 turnovers with 13 steals for a 35-9 advantage in points off turnovers. Five Zags finished in double-figures led by Chandler Smith's 23. Katie Campbell finished with 13, Jill Townsend added 12 and Zykera Rice chipped in 11. Freshman Melody Kempton nearly finished with a double-double in her first appearance as a Zag as she finished with 10 points and a game-high nine rebounds, five of which were offensive. Looks like the game will be televised somewhere somehow, can't make the game tonight but hope to catch it on line. For those local fans who cannot attend the game tonight, the game is televised on SWX and broadcast on KJRB 790 radio. Set your DVR's for 6 PM. Girls played very well in the first half. Strong start in the second. Final. Campbell is the player of the game. The ladies dominated pretty much start to finish. the Griz played well and got way way too many points in the 2nd half due to our defensive lapses. It happened just 3 minutes into the game – Fortier’s confidence was that high – and GU’s depth took it from there in a 76-52 nonconference women’s basketball romp over Montana in the season opener for both teams. The halftime stat sheet said it all: GU led 42-17 thanks to 27 bench points. Quality depth is nice to have, and GU has plenty this year. Fortier was already into her bench when the game began thanks to a finger injury that sidelined starting forward Jenn Wirth and pushed twin sister LeeAnne into the starting lineup. Three minutes in, the Zags had missed four of their first five shots and trailed 5-2. But the starters did their bit too, as Laura Stockton hit a short jumper and Zykera Rice made an emphatic block that set the tone for a big defensive night. Enter Katie Campbell, who’ll be counted on this season from 3-point range. Five seconds after entering the game, she delivered a 3-pointer that gave GU the lead for good. By the end of the night, Campbell also had delivered her best game as a Zag, with 13 points and four steals. She also went 3 for 4 from long range, wrecking Montana’s zone along with any upset hopes. “People get pretty excited when she catches the ball,” Fortier said of Campbell. At the same time, sophomore Jill Townsend delivered a team-high 14 points and six rebounds in perhaps her best overall collegiate game. “Katie’s been knocking down shots all year, and Townsie is playing very confident right now,” Fortier said. Campbell found her groove in the middle of the first half. After Chandler Smith made a pair of jumpers, Campbell tossed in another 3 to make it 20-11. Moments later, Jessie Loera found Louise Forsyth with a behind-the-back pass and Townsend drained her first 3-pointer to give GU a 31-15 lead. Campbell capped with half with a two more buckets, the last coming off a steal to give GU a 25-point lead at the break. The lead grew to as many as 30 late in the third quarter. Montana never got closer than 22 in the fourth. Montana was held to 35-percent shooting (21 for 60) and made just eight field goals in the first half. GU forced 21 turnovers, including 15 in the first half. While Fortier had hoped for more consistency on the glass, the Zags still won the rebounding battle 42-34 while holding the Griz to nine offensive boards. Rice had 11 points and a game-high nine boards. Stockton added 13 points and four assists while going 5 for 6 from the field. Montana’s McKenzie Johnston had a game-high 17 points. The game was the first of three straight against teams from the Big Sky Conference. GU’s next contest is Sunday at Eastern Washington, which beat Simon Fraser 72-66 in an exhibition game on Sunday. The Zags are back home on Tuesday night against Idaho State. SPOKANE, Wash. -- The Gonzaga women's basketball team opened the 2018-19 season in style with a 76-52 win over visiting Montana Wednesday evening at the McCarthey Athletic Center. It marks the 14th-straight home-opening win for the Zags, dating back to 2004. The Zags made 44.9 percent of their shots from the field, while limiting Montana to 35.0 percent. The Bulldogs was 6-of-16 (37.5 percent) from long range while the Griz were 2-for-15 (13.3 percent). Four Bulldogs finished in double-figures led by Jill Townsend's career-high 14 points. The sophomore was 5-of-12 from the floor including 2-of-3 from beyond-the-arc and was a perfect 2-for-2 from the line. Katie Campbell also posted a career-high with 13 points to go along with a team-high four steals. Laura Stockton and Zykera Rice added 13 and 11, respectively. Gonzaga (1-0) was dominate inside with a 40-28 edge inside the paint while controlling the boards 42-34. The Zags forced 21 turnovers on Montana (0-1) while collecting 14 steals, and the Bulldogs' bench made a huge impact, outscoring Montana's bench 36-7. "21 is a great number to have on turnovers forced," head women's basketball coach Lisa Fortier said. "A lot of them were live-ball turnovers which led to baskets and fouls for us, so we were able to get to the free throw line. I really like how they are getting after it." 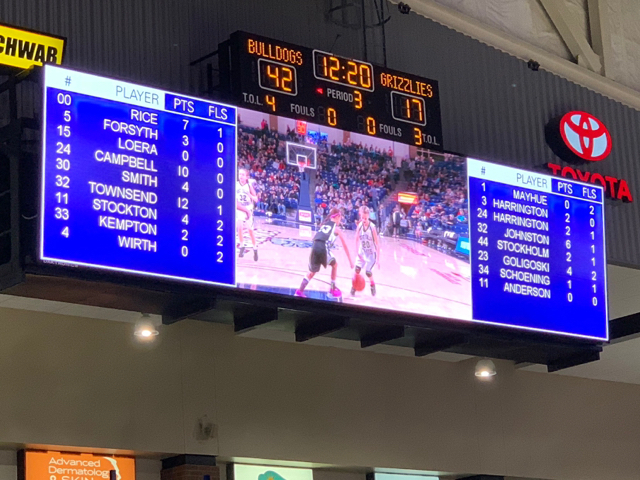 The Bulldogs gained a 12-point lead (23-11) by the end of the first quarter and extended their lead to 25 (42-17) by the end of the first half. GU limited the Griz to just six second-quarter points behind a strong defensive effort with six steals and turnovers forced. The Zags opened the third on an 11-4 run to reach their largest lead of the game at 32 (53-21) following a jumper from Chandler Smith at the 6:36 mark of the third quarter. Gonzaga cruised in the fourth for the 76-52 win. McKenzie Johnston paced Montana with 17 points and seven assists. Jace Henderson led the Griz with a game-high 10 rebounds. The Bulldogs continue play on the road Sunday, Nov. 11 with a 2 p.m. tipoff at Eastern Washington in Cheney, Wash. Impressed by Katie Campbell's two pick pockets and layups off them. Katie (Mighty Mouse) really has stepped up her defense from last year and her whole game seems to have improved. And she also has new found confidence. Zykera Rice still has hops to get those rebounds and she is a presence. Melody Kempton runs the court well and not afraid to bang with the big girls. Shout out to Jill Townsend who looked confident and highly motivated. Chandler Smith and Laura Stockton were both great. Congrats to the Lady Zags on their first win of the season! Here is a link to a photo gallery from tonight's game. I love the energy of this team: fast-paced play, offense generated by defensive takeaways, lots of ball movement. Last year it seemed as though there was some standing around, get JB the ball and hope she would make something happen, this year everyone is part of the action. Three point shooting has much improved. Nice work everyone, excited to see what happens next. Still a lot to work on, but to be expected. It’s nice having five players on the floor that are ready to shoot when given the chance. When you have your team wanting and trying to move the ball, you need use up as many breaks as possible while saving one for the end. The team played tired the second half... won’t work against top teams. Guards at the wings.. a few drives to the elbow and making the 10 footers will help keep them open for the three. They were giving CS some distance. JL needs to start thinking about shooting as a 2 rather than passing like a 1... more than capable. We talked about the bench making the difference this year... that’s what makes for very good teams. Sad point... seeing all that talent standing in the huddle in street clothes. The Eags up next... first semi road game... what color uniforms? It looked like one should have been able to watch on line, but could not get it to stream. Had to settle for on-line stats. Was able to stream the radio station and listen. Was not able to stream the radio station other years, sounded like the zags had a new radio voice, does anyone know if this is permanent, he did a good job but also liked the old announcer. Did anyone else tune in to Steve M. on the radio for the the post game? I don’t know if it’s Steve’s equipment or GUs, but it needs to be looked into. When Steve is broadcasting... you need to turn up the radio. When he passes it back to the station, you need to turn your radio down or get blasted. When he did the interview with Staci, couldn’t hear her... which was sad. Really enjoy Steve... he and GU need to fix the problem. Lots of folks rely on the radio to follow GU WBB. any news on the radio talk show?? I was disappointed overall with the game against Montana. As most of you know, I am a defensive guy and despite all the headlines about great defense last night, I did not see much of it. If Montana did not shoot less than 30% overall and 0-8 from 3 in the first half, most of us would have felt the tightening of our collars come the 4th quarter. Like many times, last year, the team did not put together a full 4 quarters of good basketball. Yesterday it was good enough to beat Montana, it will not be good enough in the WCC. - It was a win. - For the second game in a row, decent shooting numbers (44.9% overall, 37.5% from 3 pt range & 72.7% FT). - For the second game in a row, consistent shooting the entire game with shooting percentages ranging from 44.4% to 46.2% for each of the 4 quarters. - Scoring was spread out within the team with 4 players with double digit points. - KC from downtown last night, 3-4 from 3 and 5/8 overall. Great job for the 2nd game in a row. - JT was a monster on both sides of the ball. She and KC where the only players who seemed totally into the game. - 14 Steals was awesome. - Second game in a row without a shot clock violation. Great ball movement leading to good shots (even though we missed a bunch of bunnies). I will preface my not so positive comments by saying that Townsie played great on both sides of the ball, so any comments on defense certainly do not apply to her. I agree with Sylean, she just as easily could have earned POG last night but Katie played well enough to deserve the callout as well. - The guards were, almost universally, beaten continuously off the dribble. Rarely did a guard stay in front of the ball. If they did not get the steal, they got beat. - "Z" did not seem to be herself last night. Final stats say she played o'k, but she only shot 33.3% instead of over 50% and she missed a bunch of bunnies & 6 (??) turnovers. - "Z and" LW rarely established inside position on either side of the ball, choosing to play from behind for most of the game. "Z" did not dominate inside like usual. - Way too much double and triple teaming in the key leaving wide open wings. One day an opponent is going to hit those shots. - Here you go ZAB, LS needs to stay on her feet and in front of her opponent. She needs to quit jumping at people and taking herself out of the play on simple pump fakes. - Lady Zags were outplayed, out hustled and outscored in the 2nd half. This can't happen at any time let alone against Big Sky competition. - Montana 1st half points = 17. Montana's second half points = 35. What happened at halftime? - Gonzaga second half points = 34, Montana second half points = 35. - Total Rebounds, Gonzaga = 42, Montana = 34. The Lady Zags should have had 50-100% more rebounds than Montana. - Top Big, consider Montana's Jace Henderson (F), 60% FG, 6 pts, 10 rebounds, 4 asts, 2 stls, & 1 blk or McKensie Johnston (F), 50% FG, 17 pts, 4 rebounds, 7 asts, 2 stls. Where were our bigs? I realize that when a team has a big lead it is hard to keep your focus the entire game, but this is Montana (no disrespect intended) not SMC or BYU, let alone Notre Dame, Stanford or WSU. I also realized that this is game 1 but defense typically comes together much faster than offense, but on this team, the offense looks leaps and bounds ahead of the defense. I understand Freshman (and I include LF in that category) looking a little lost on defense, but everybody else should be on the same page and it definitely did not look like it last night. Perhaps "too" much help defense led to the triple and excessive double teams and subsequent wide open wings. The team has two weeks (four games) to fix the defensive side of the ball. In two weeks, things get real serious real fast and the teams in Vancouver will make the ladies pay for their lack of defensive intensity. Still got time, and no better time than in Cheney, Sunday afternoon to work out the kinks. Last edited by ZagDad84; 11-08-2018 at 07:27 PM. I agree Zag Dad on your defensive thoughts. There are a few different ways to play defense. There is the physical, knock down challenge every shot defense and there is the big play, trapping, stealing and a little gambling type of defense. We have the players for the big play defense which when it is working leads to alot of offensive opportunities. I think that why most people thought we played great defense last night. I think we had a good first outing. Hopefully the offense will continue getting everyone involved. The bench will get a little thinner as I hear that Corrine has left the team for personal reasons. sorry to hear about Corrine......I know she must have been disappointed with her skimpy playing time...its hard to sit on the bench knowing that your sister plays or played across town. I think it's the new normal sylean. Pretty much everybody is seeing some attrition these days. Some more than others. I don't know where you draw the line on how many is too many. Nobody likes it, but not sure there's any stopping it now that the genie is out of the bottle. It might make you happy to know that Graves and Oregon lost 4 players unexpectedly after last year was over. 3 to transfer and one returned to Europe to play professionally after only 1 season. None of them were their key players but their depth took a big hit. The really fun part about the large increase in transfers is that the NCAA keeps granting immediate eligibility to some of them, but not all. It appears to be at random. The NCAA will contend they have a reason for doing this, but as usual there is no transparency to their decision making process.